Signs already hang in the windows announcing that a Hero Certified Burgers will be moving in to the 581 Bloor Street West space. 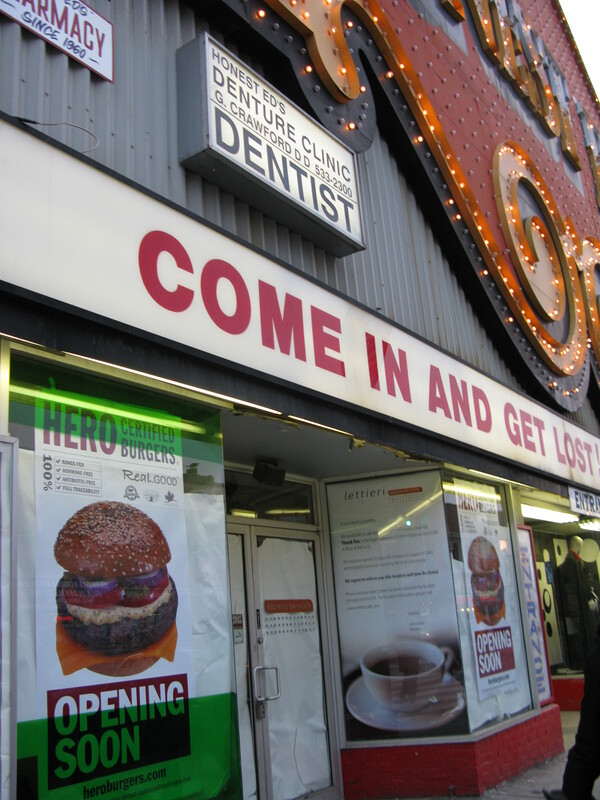 The Lettieri website says cryptically that Lettieri is “co-branding with Hero Certified Burgers”. Lettieri directs readers to the Hero website for further information, but we found no mention there of Lettieri or of co-branding. John Lettieri is the founder of both the Lettieri Espresso Bar and Hero Certified Burgers franchises. 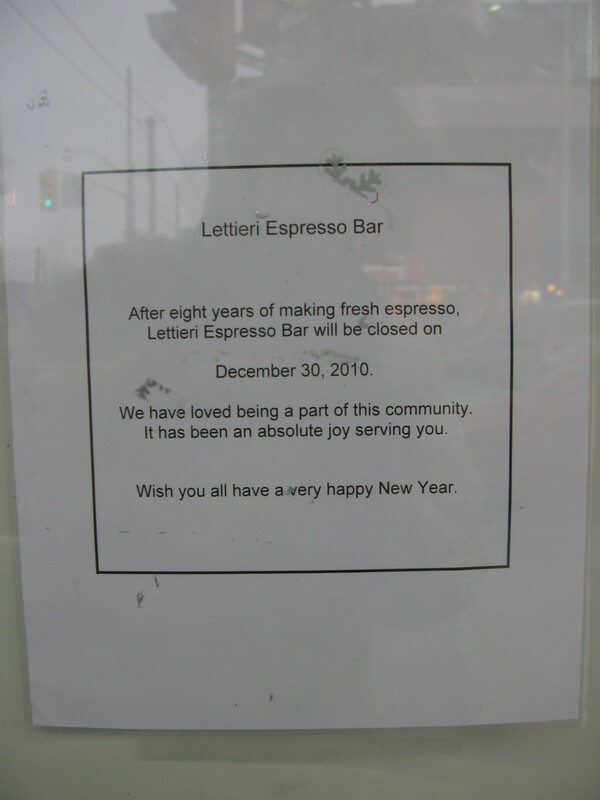 It’s hard to say what lead to the demise of Lettieri. Once inside the shop, it was an attractive, soothing, light-filled space with large east-facing windows looking out on Bathurst Street. And Lettieri made arguably the best-tasting espresso-based drinks of all the chains located on the West Annex Bloor strip. 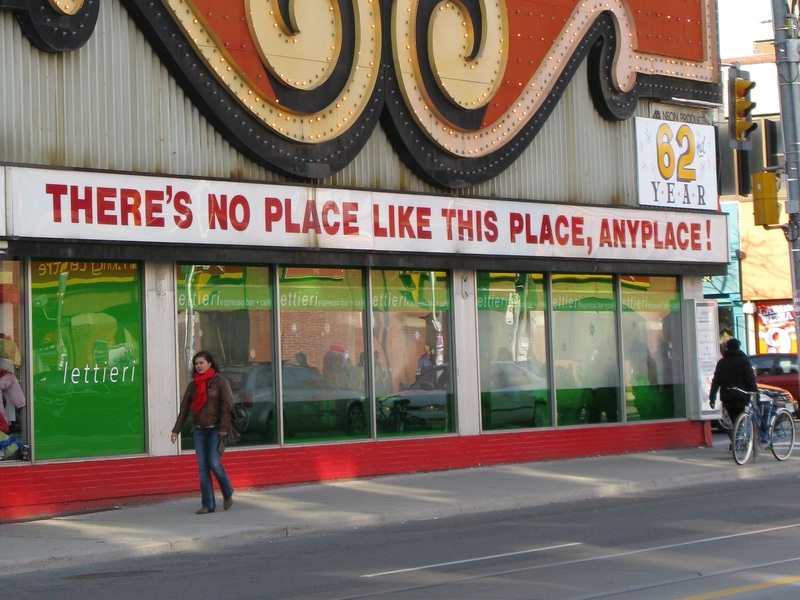 But tucked in the north-east corner of Honest Ed’s, the garish extravagance of Ed’s signage overwhelmed that of Lettieri’s; it was easy to forget the coffee shop was even there. And Bathurst Street still forms a considerable psychological barrier for Annex shoppers. Although the number of non-Korean-themed shops establishing themselves west of Bathurst on the Bloor West strip is increasing, many shoppers still hold on to the notion that Bloor west of Bathurst is a Korean ethnic enclave with little to offer shoppers who do not share that ethnicity. As we noted in a previous post, the stiff competition with four major coffee chain outlets killed a local tea shop in 2010. With that competition located on the more desirable West Annex side of Bathurst, the few extra steps to cross the street into Koreatown apparently proved a few steps too far for Lettieri’s survival. Visit the Arrivals & Departures archive.